by Rob, A long time user. for anyone to use, within the limits of the free license. First of all it is based upon the opendoc (CORBA) paradigm, meaning all files are containers whose content depends upon the program that acts upon it. In short RagTime is the complete office suite in one program, or the AppleWorks program for that matter but with qualities to stylesetting more compatible to QuarkXpress. To create a document you have to create a frame of a certain dimension and assign a content to it. Afterward you can manipulate the frame and the content as wanted, or even create a frame from a collection of line and bezier tools. Just do not forget to – after closing a frame up so it has one boundary – assign a content to it. Each file belongs in a so called container, each container can contain information of a particular nature: text/drawing/bitmaps/spreadsheet/movie/sound et-cetera. one information processor. For a paid solution it gives you the best between word and quark, no more hassle to place a picture at a certain position, it is there and stays there and you can tell your text what to do: flow around it or skip below it. In short it starts to deliver where word stops and quark seems needed. There is a really cool web site on Apple.com that a listener turned me on to and I can’t believe I had never seen it before. The Apple Student Gallery site features animations, films, photos and music from students around the world. Any student can submit their material for inclusion and I can’t believe this site is not more well known. The site offers the ability to rate the content and share it with others and some of the stuff on there is really interesting. If you have a moment and want to see what the youth of the world is up to on their Macs, I would encourage you to check it out. A podcast about all things Macintosh. For Mac geeks, by Mac geeks. Show 128. Windows Vista delayed until 2007. Rumor of Virtualization technology in Leopard. US supports Apple in French DRM ruling. Adobe CEO reveals dates for Studio CS 3. Windows XP on Mac review and XP on Mac benchmarking. Warning on using Migration Assistant with Intel Macs. Question about Motorola RAZR V3 support in OS X and the longevity of software for PowerPC Macs. Airport Extreme Card antenna connector issue. Tip to securely empty the trash. Question on iTunes video playback performance vs. Quicktime. A podcast about all things Macintosh. For Mac geeks, by Mac geeks. Show 127. Windows XP Boots on Intel Mac. User reports “torched” MacBook Pro MagSafe connector and reports of strange noises from MacBook Pros. First “full length” movie surfaces on iTunes. Apple posts new non-silhouette iPod Ad. NCAA Tournament on iTunes. Mac “rumors” roundup. XP on Mac, do we want it? Do we need it? Follow-up on Apples new India support facility. Tips on keeping up with software updates. A podcast about all things Macintosh. For Mac geeks, by Mac geeks. Show 126. Vista will not boot on MacIntels. Multipass purchase option added for iTunes video. Apples 30th birthday plans. Apple setting up tech support in India. New Apple Retail Store in Reno, Nevada. Apple releases another security update. New French law may say “au revoir” to iTunes France. Follow-up on Tesco Apple Mini Stores. Follow-up on FrontRow Enabler 1.2.1. Listener thoughts and impressions of the 17″ iMac Core Duo. Will Apple build iSights into Cinema Displays? How to disable Dashboard to free up memory, the Widget Killer. Tips and tricks to manage podcasts in main iTunes library. Using multiple Macs with Apple IR remotes, remote pairing. I was having fun on this job! You had all this energy, and all these crazy ideas… and you kept taking your pants off. OK. So my UK listeners are giving me quite an education of Tesco in the UK. Most tell me that Tesco was the most profitable supermarket retailer in the world last year beating out WalMart. Tesco is first and foremost a Supermarket and sells food, but they have been expanding. Now there are 3 types of Tesco stores: Tesco: These are medium to large size stores and sell mostly food with a very limited electrical section. Tesco Extra: These are the flagship stores. These stores sell almost everything. Food, clothing, DVDs, some computer accessories etc. The Extra stores would be the most likely ones to get Apple Mini stores. Tesco Express: These are the smallest of the stores, mainly situated on housing estates, they operate very much like a corner shop. Apple did a small test of the Mini store concept and listener Nik sent in the picture above from the Milton Keynes store. 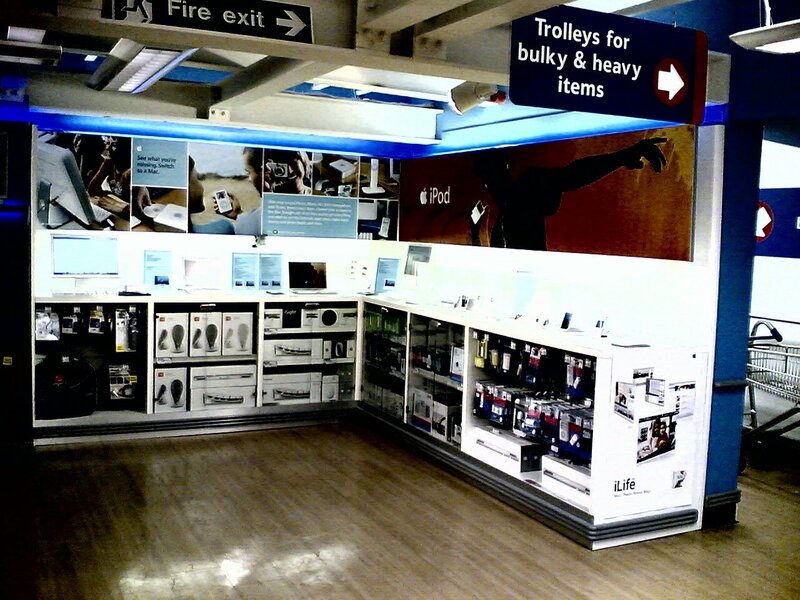 If you have any picts of an Apple Tesco Mini store send them in and I will add them to the gallery. Thanks to everyone who emailed and educated me on Tesco. A podcast about all things Macintosh. For Mac geeks, by Mac geeks. Show 125. Video iPod rumors get “Bigger”. Apple movie store research uncovered. UK Retailer to add “Apple Zones” and Apple Retail Germany. Rumor of UK iTunes TV downloads soon? Apple Retail Store in Dallas opens this weekend. Apple releases software and security updates. Mac Mini Hacked in 30 minutes (maybe). The Pope gets an iPod Nano. Apple releases another firmware update for 1.8 single G5s. Apple files trademark for ‘MacBook’. Discussion of Intel Mac Mini benchmarks and opinion on integrated graphics. Review of Crystal Film CoverSets. Open Firmware correction and follow-up. Countering the “Macs are more expensive” argument. Getting better FrontRow performance. Promos from the Math Grad Podcast, Peter’s Mac Tips and ScreenCasts Online. Mul-ti-pass. Yeah, multipass, Steve knows it’s a multipass. OK. Obscure sci-fi movie reference aside, it appears Apple has added some new content and features to the TV Show section of iTunes. Several listeners pointed out that Apple added more Comedy Central offerings in the form of The Daily Show, with John Stewart and The Colbert Report. In addition they added a new purchase option for these shows. Multipass. 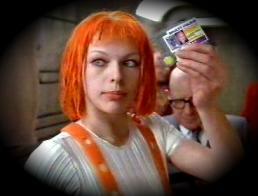 Yeah Leeloo, multi-pass (sorry, it just too easy). Multipass is $9.99 (USD) and includes the most current episode, if available, and downloads the next 15 episodes. Seems very much like the paid Podcast subscriptions Audible is doing for shows like The Ricky Gervais Show. Multipass is a cool new option, but I’m not sure I will be canceling my cable or TiVo service quite yet. Well I of course have always been a big fan on Nitrozac and Snaggy’s Joy of Tech and I love Penny-Arcade and PvP. So, how is it I could have missed this one. AppleGeeks looks incredible. It is amazing how the Internet is freeing media and content creators in all genres to get their work out to the masses. Web Comics, Podcasts, Blogs, Video. I love this stuff. I am sure there are many other web-based Geek comics out there, so if you get a chance head over to this forum thread and post your favs.